Bishop Musa Fomson, who predicted former President Goodluck Jonathan’s loss in 2014, lamented that “the blood of the murdered innocent is crying to God for vengeance”. 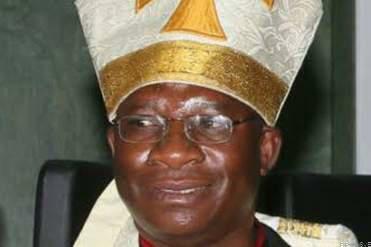 The clergyman, has prophesied that the politicians behind Zamfara killings will be exposed in a matter of weeks. In his message released ahead of the New Year, Bishop Fomson warned that the only thing that will save the people behind Zamfara killings from disgrace is if they repent and confess their sins. He also declared that “those who sow human blood in the hope of reaping political powers will be exposed and disgraced before we celebrate the resurrection of our Lord Jesus, whose birth we celebrate this season. “Embittered politicians are the one behind these killings. They empower killers. They sow sorrow. But it is a business that they have just a few days to repent of lest the disgrace that they have been piling up will be heaped on their head. “Their ways are unclean in the manner of the abomination of the idol worshipping rulers that led Israel to sin in the Books of Chronicles and Kings. They walk in dark paths and shall perish if they refuse to embrace light, confess the sins they have committed against Nigeria by being behind the killer bandits.